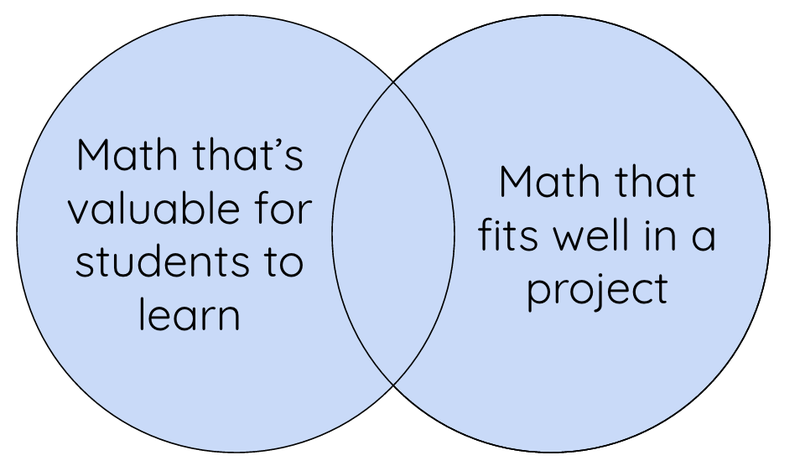 In my previous post, I wrote about a journey that began 18 months ago, where I intended to tweak my school network’s project-based learning (PBL) approach to math. My experience as a teacher led me to believe that a mix of problem- and project-based learning was worth pursuing, and people rallied behind this. The next step was figuring out how to make it happen. The book Little Bets was fresh in my memory at the time (I’ve written about it previously). One lesson I took from the book was to start small and learn from experimenting; to not expect ideas to come out fully formed. With that in mind, I made my first attempt at working problem-based learning (PrBL) into our existing system by considering: what would teachers be able to try (and be excited about trying) ASAP? In our Booming Populations project, students model with functions to predict the population of a developing country of their choice, decades into the future. In that project, we added Desmos’s Penny Circle because it had students using different function types to model, extrapolate, and predict. We also added Dan Meyer’s Super Stairs because it provided an opportunity to discuss some of the nuances of modeling, specifically estimation and approximation, that were applicable to Booming Populations. In our Investment project, teachers ran a class “bank” with many account offerings, and students would invest an allotted $1000 of imaginary money with the goal of maximizing their yield. Since this project hinged heavily on linear and exponential functions, we used Robert Kaplinsky’s In-N-Out Problem (about calculating the price of a very large cheeseburger by using a linear pricing model) to develop understanding of linear functions, and Dan’s Fry’s Bank (about calculating the value of a bank account 1000 years into the future) to develop understanding of exponential functions. In our Event Planning project, students acted (unsurprisingly) as event planners, budgeting the costs and revenues for an event of their choice, such as a concert or school dance, and presenting on the event’s finances (specifically the “break-even” point). Since this involved finding the intersection of a cost and revenue curve, we included a MARS formative assessment lesson on systems of equations. And because this project involved some challenging aspects of modeling (making assumptions in order to simplify the problem, identifying independent and dependent variables, among others) we incorporated a problem I made about cell phone plans that flexed some similar modeling muscles. Incorporating problems into projects felt right in a lot of ways. It addressed head-on the concern that students spent too much time on the product and not enough time on mathematical thinking and conceptual development specifically. Giving kids exposure to mathematical topics in more contexts (e.g. hamburgers and bank accounts) also felt right, and allowed for more “a-ha’s” about the math (an unofficial but important metric) compared to previous iterations of the projects. What constitutes a math problem, anyhow? The problems we chose ranged from 3-Act Tasks to MARS FALs to Desmos activities and more; some used real-world contexts and some lived in pure math. Was it wise to have a definition this broad? What makes for a great problem? What should we look for as we navigate the overwhelmingly infinite banks of math problems that are out there? What does instruction look like with PrBL? Our org’s PBL “playbook” would need updating if “problems within projects” were to become the norm. Most importantly, as we considered moving from little experiments to widespread implementation, did we believe this approach was the right path forward? To the final question, the answer was yes and no. By the mere fact that we were now able to incorporate math tasks that we knew had high value, I was confident that PrBL was here to stay. At the same time, implementing PrBL by nesting problems within projects wasn’t sufficient; it addressed some concerns, but not enough. Specifically, two major issues remained. Implementing problems only within projects meant that we hadn’t addressed the fact that some math topics don’t lend themselves well to projects. If projects were to continue to be the organizing structure, then we would still be devaluing or omitting math that doesn’t fit well into projects. Additionally, coherence was still an issue. In our existing PBL model, the student experience revolved around what was needed to move forward in the project: e.g. first choose your country, then research the demographic data of the country, then analyze it, etc., working up to compiling your report or giving your presentation. That coherence took a hit with this new approach, as we leave the project context temporarily to do conceptual development tasks. Further, as we worked to maintain the coherence of the project experience, we felt a compromise on the coherence of the mathematical ideas. We found that it was possible to either organize the project around the final product OR the development of mathematical ideas, but we had difficulty maintaining a coherent multi-week experience when trying to do both. Though fruitful, this experiment with PBL & PrBL sent us back to the drawing board. Coming soon, I’ll discuss what we tried next.